Here awhile back, over a year ago, because I watch way too much online video, I found one of a woman named Nadia Bolz-Weber. She was speaking at some sort of youth rally and her message was really captivating, it got my attention, and I related to a lot of what she was saying. I admit I was somewhat surprised to learn she is a Lutheran minister. I know zero about being Lutheran, but she looked and sounded like what I’m used to, so I Googled her name, which led me to the website for her church in Denver: House for All Sinners and Saints. Google revealed that Nadia is also a Patheos blogger and I was already reading a few blogs over there, so I subscribed to hers, too. So yeah, for a little over a year now I’ve been reading her blog/listening to her sermons. Well, I was super excited to find out a few months ago that she was writing a book and even more excited to find out there was a book tour, and even more more excited to find out that NYC was going to be a stop on the tour. As soon as there was a date, I made plans to go. There were a lot of clergy there, a lot of Lutheran clergy, so the Q&A at the end tended to be about Lutheran-y, minister-y things. It was pretty interesting, even to someone who is not 1) going to seminary, 2) planning to go to seminary, 3) currently a minister, or 4) Lutheran. Afterward, there was a book signing, but since I only had the ebook on my phone and you really can’t sign that, we didn’t stay. That could have been awkward. I recommend Pastrix as a fascinating, humorous, and moving memoir. I also recommend hearing Nadia Bolz-Weber speak, either in real life or online. I promise you will be entertained, but you’ll also hear some very important things about God and grace. 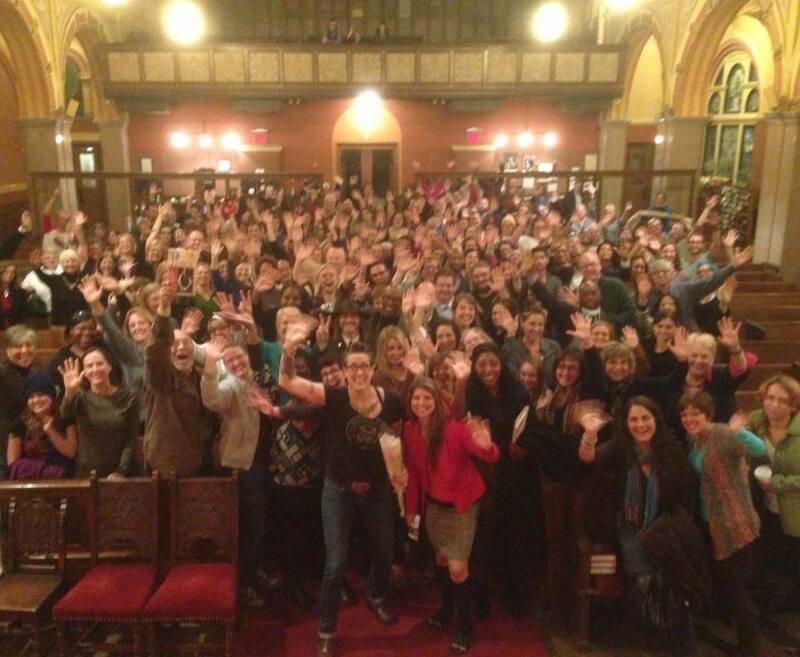 My tiny head is in this image that I grabbed from Nadia’s FB page.